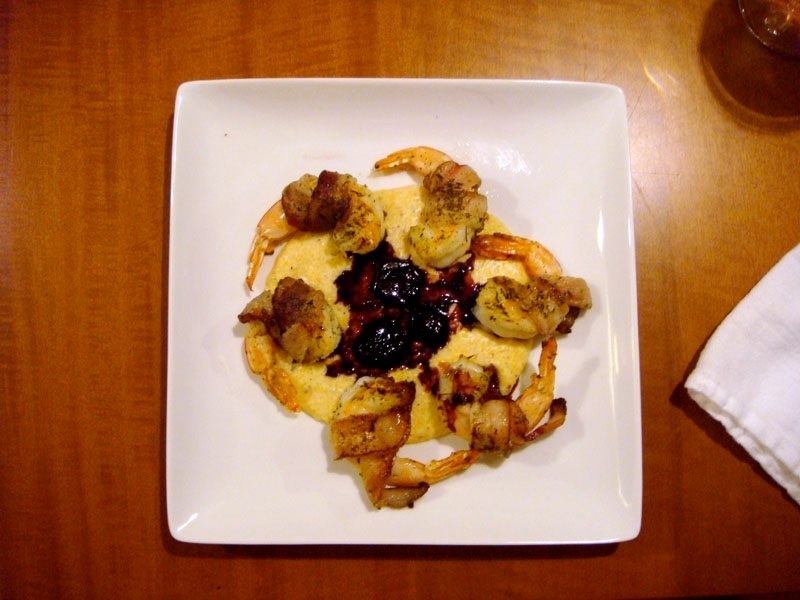 Bacon-Wrapped Shrimp with Polenta and Port Wine Fig Sauce — Top Chef Night | Eat.Drink.Life.Love. The flavors of fall are rich and warm. When I think of autumn, I think of chai spices, roasted root vegetables, warm apple cake, caramelized onions, bacon and figs. It’s starting to get cold here in Minnesota, so how could we possibly resist chef Grayson Schmitz’s bacon-wrapped shrimp with polenta and port wine fig sauce (click here for recipe)? When autumn is on the precipice of winter, there’s nothing better than a belly full of fall flavors then settling in on the sofa to watch some Top Chef. We couldn’t find head-on shrimp, but we found big ol’ tail-on shrimp that seemed to fit the bill. While K took on the unenviable task of cleaning them, I cooked up a few strips of bacon. We ate the bacon (bonus bacon amuse bouche!) and I used the bacon fat to caramelize some shallots. Then I used the bacon fat *again* and added milk, a little cream and some polenta. Genius polenta tip garnered from Momofuku’s David Chang: Do not use instant polenta. Use corn grits/coarse ground polenta (Bob’s Red Mill is affordable, tasty and goes a long way). Soak the polenta for a few hours in just enough water to cover them. Drain as much water as you can and cook the polenta as you usually would (or according to the recipe). Quick cooking, amazingly creamy polenta every time. The polenta simmering on the stove, K began wrapping the ginormous shrimp in the thick-cut bacon we received from our farm co-op and I got to work on the port wine fig sauce. Shallot, red onion and dried figs were sautéed in butter. Sugar was added and caramelized. Port and red wine were added: Less than what was called for in the recipe as four and a half cups of liquid seemed like it would result in an awful lot of sauce. I threw in the autumn spices — cinnamon, allspice, star anise, cloves and peppercorns — and the sauce simmered wildly so it would reduce and thicken. The stove was a carnival of simmer when K began sautéing the thyme-sprinkled, bacon-wrapped shrimp. Bacon-wrapped shrimp, ready for the saute pan. That’s when things suddenly turned into a festival of frustration. The pan had to be hot, but not so hot that the bacon would burn and the shrimp would overcook before the bacon was finished. 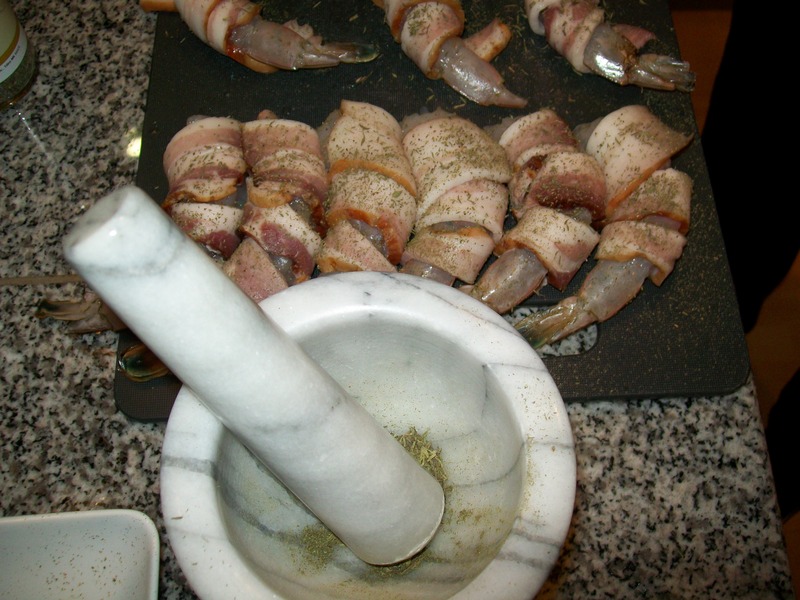 As the bacon began to cook, it also began to curl off the shrimp. When the shrimp were flipped, things really started to unravel. K watched his work unfurl before his eyes. Very discouraging. Still, the kitchen was filled with such wonderful smells and we were hungry so, despite the aesthetic setback, we had a dinner to get to! And what a savory celebration of flavors and textures it was. Big, sweet shrimp that popped when you bit into them, a hint of thyme freshness and thick, smoky, salty bacon. Hot, smooth, creamy polenta with bacon undertones and rich, voluptuous, ruby sauce flecked with chewy bits of fig. Perhaps not the work of art K had hoped for, but sooooo fantastically delicious. I think luscious flavors are beautiful, so a lovely dinner was achieved. Alterations: Used two slices of bacon to render instead of the recommended six, used two percent milk instead of whole milk, used one cup of port and one cup of red wine (not 4.5 cups). Would we make this again: Yes. Hopefully we can find thinner slices of bacon to make things a bit easier. Bonus: We had leftover polenta that I thoroughly enjoyed for lunch the next day. We also had leftover fig sauce that we used on some grilled lamb. Fabulous.